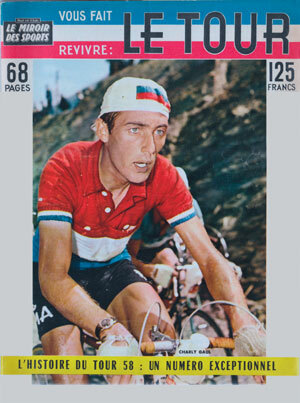 Charly Gaul, the master mountain climber from Luxembourg, won the 1958 Tour de France by over 3 minutes, even though he did not win the King of the Mountains prize. That went instead to Bahamontes who had taken the points on the climbs then eased back for the relative comfort of one of the chasing groups. But the stages were marked by the number of crashes. 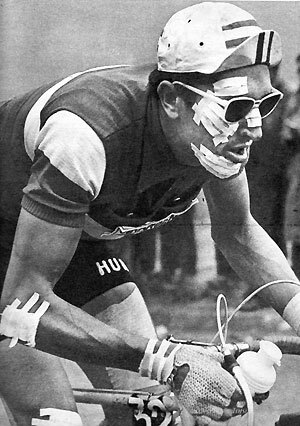 It started when the French hope Jean Forestier was out after stage 1 - Bruxelles to Ghent - with a broken wrist. And the carnage continued all the way to Paris. This spectacular freeze-frame was the sprint finish on the cinder track (!) at Bezier (Stage 16). 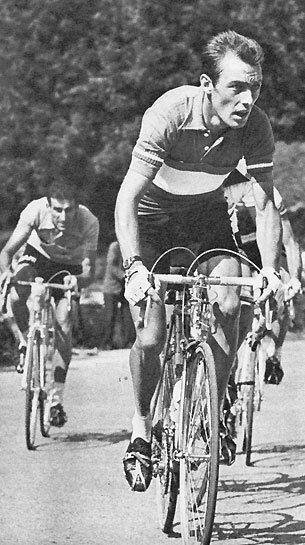 Claude Collotte of the Centre-Midi team looks totally out - but he continued; only to retire on the stage to Aix-Les-Bains. Giuseppe Pintorelli of Italy struggles on despite his “HG Wells” appearance. The Green Jersey winner - Jean Graczyk of Centre-Midi. 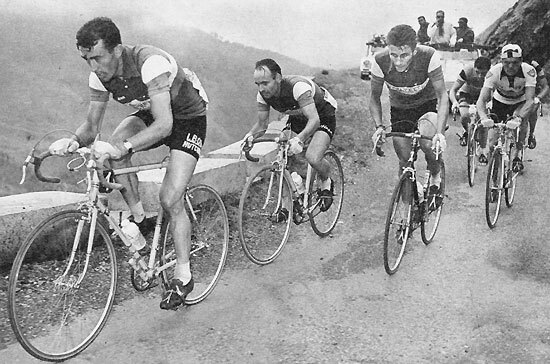 Louison Bobet leads Gilbert Bauvin, Jacques Anquetil and Brian Robinson on the climb of the Aubisque during the Dax to Pau stage. They reached the summit 8m10s behind the leader Bahamontes. But the stage winner was Louis Bergaud (2nd over the Aubisque at 32sec) with Bobet 4th and Robinson 6th. Raphael Geminiani finished 12th and took the Yellow Jersey from Darrigade. Despite his climbing ability, Gaul was only lying 3rd on GC at Besancon with all the mountain stages completed and just two stages to go before Paris. Rather it was his crushing time trial performance that won him the Tour. He took over 3mins out of race leader Vito Favero of Italy and won the Besancon to Dijon stage by 48sec from Gaston Nencini. 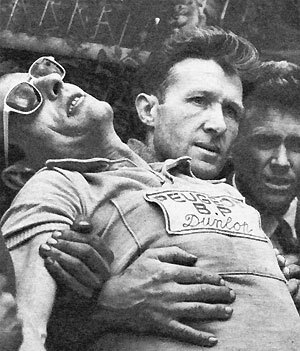 A dejected Jacques Anquetil retired while lying 6th at 17mins down on GC. 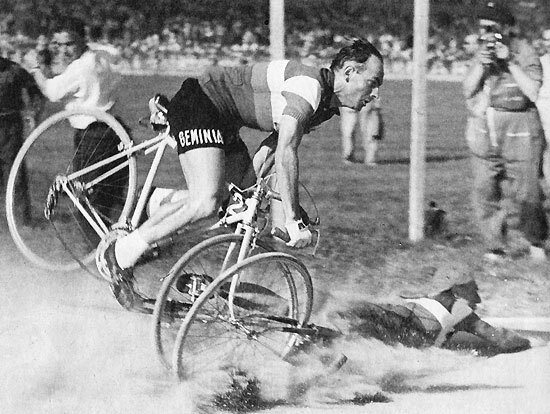 Baffi then won the final sprint at the Parc des Princes from Graczyk and Nencini. Gaul was home riding into Paris wearing yellow for the first time in the race.